Ian Park hopes to stick with the Eagles this season. During training camp, the Eagles locker room at the NovaCare Complex, a long, expansive highway during the regular season, is crowded with a double row of lockers down the middle of the room. These are the temporary quarters inhabited by the influx of camp players, most of whom, in the famous words of Buddy Ryan, will be allowed to "get on with their life's work" by the time the real games approach. Every year, however, some players are able to escape the median strip of portable lockers to the safe haven of the more lush, permanent stalls that line the room, but it is a difficult game of Frogger and traffic is fierce. Still, if there is camp, there is hope. Midway through the room is the space occupied by 6-foot-4, 315-pound Ian Park, one of a small handful of players attempting to win a job as a reserve center, either on the active roster or on the practice squad. The odds are probably against him, as they are stacked against the other undrafted free agents, but Park has been running uphill for a couple of years now and this is nothing new. "I try to just calm down when I get out there and just play," Park said after practice recently. "I try not to stress out too much." To this point, which is to say more than a month from the season, a week away from even the first exhibition game, it is too early for any meaningful appraisal. Park is putting in the work, the coaches are encouraging, but the most attention he has received is for an internet video of him singing the theme from the video game franchise "Halo" in the resonant confines of the shower room. It's pretty good, but offensive linemen aren't generally judged for their tenor range and, anyway, rookie tackle Jordan Mailata might even have him there. 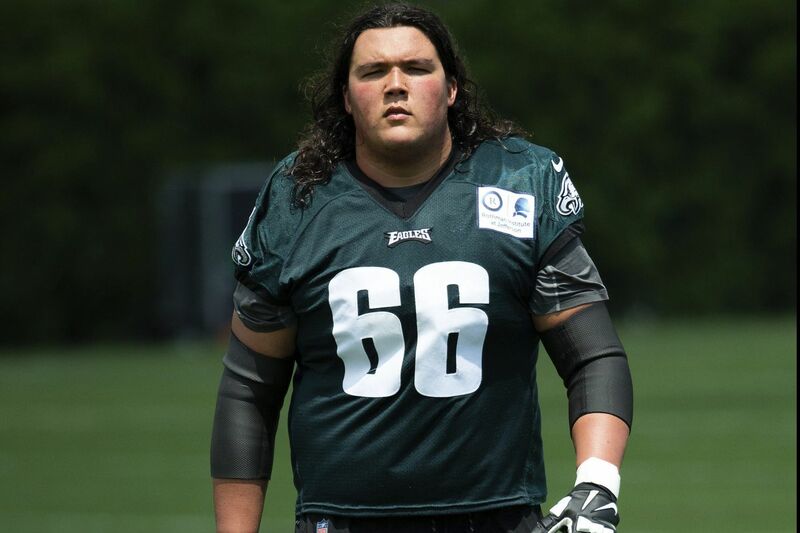 Maybe Park is the second-best singer on the O-line, but he'd settle for also being considered the second-best center in camp, behind entrenched starter, and another noted entertainer, Jason Kelce. Park's competition at the moment is third-year veteran Isaac Seumalo, who has started at three positions for the Eagles, none of them center; and Jon Toth, who was an undrafted free agent a year ago, was cut at the end of training camp, and spent part of the season on the practice squad. Steven Wisniewski also can play center, but he looks firmly entrenched at the left guard position he won from Seumalo. Ian Park, then with Northwestern, congratulating fullback Dan Vitale (40) for scoring a touchdown against Ball State in September 2015. "I've learned more from [offensive line coach Jeff Stoutland] than I've learned from anyone else in my entire career," said Park, 24. "He's got a great system. My original intention was to play two positions, but he's got me at center and that's probably more of a fit for me in this league, size-wise." Park hoped his shot in the NFL would come a year sooner, but that was before his career took an unexpected turn and he had to leave Division I football before finally reestablishing himself in Division II. It's not the usual path, but it was the only one he had. Heading into his fifth year at Northwestern, the redshirt senior suffered a serious Lisfranc injury in his foot during spring ball. The injury required two surgeries and kept him from playing in the fall. It also tripped the clock on his Division I eligibility. "That was one of the toughest times in my life. I loved Northwestern, and my dream was to finish out there," Park said. "I couldn't play there, but the rules in Division II are different. It's not a five-year rule. It's a 10-semester rule. I had completed my degree in eight semesters, so I had two left if I wanted to play Division II. I wasn't sure what I wanted to do. Even my family was split. But I figured I only had one chance to do this." The Pittsburgh native visited three PSAC schools in the western part of the state before deciding on Slippery Rock for his final season of college ball. He was all-conference in his one season, enough to impress NFL scouts, including those from the Eagles, that he was healed, but the game was definitely a little different. "Guys work just as hard in Division II, and have big hearts and a lot of guys were pretty talented, but there just isn't the funding a team in a Power Five conference gets," Park said. "You have to buy your own shoes, your cleats, your travel sweats, and stuff like that. Northwestern has this new training facility on the lakefront with flat-screen TVs and big pools. At Slippery Rock, we had a little aluminum tub and some tables. It's all about perspective. I tell my friends from the Big Ten who complain about this or that, you've got to see the whole picture." The scouts still found him there, and they also saw him at Penn's pro day, which included a number of small-college players. It was the Eagles who signed him, however, and now Park waits to see which way his career goes from here. "The playbook is a lot, obviously, and learning the defenses and making the conversion calls. I study every night, and I know it's going to take time," Park said. "It's just about having confidence, staying focused, and doing your job." If he makes it, and the coaches end up singing his praises, Park will even be able to join in.